We use timers every day – the most simple one can be found on your wrist. A simple clock will time the seconds, minutes and hours elapsed in a given day – or in the case of a twelve hour clock, since the last half-day. AVR timers do a similar job, measuring a given time interval. For the above example, our period becomes .01 seconds – so our timer will measure in multiples of this. If we measure a delay to be 45 timer periods, then our total delay will be 45 times .01 seconds, or .45 seconds. For this tutorial, I will assume the target to be a MEGA16, running at at 1MHz clock. This is a nicely featured AVR containing certain timer functionality we’ll need later on. As modern AVRs come running off their internal ~1MHz RC oscillator by default, you can use this without a problem (although do keep in mind the resultant timing measurements will be slightly incorrect due to the RC frequency tolerance). We’ll start with a simple example. We’ll create a simple program to flash a LED at about 20Hz. Simple, right? The AVR timer circuits come in two different widths, 8 and 16 bit. While the capabilities of the two timer types differ, at the most basic level (simple counting), the only difference is the maximum amount of time the timer can count to before overflowing and resetting back to zero. Those familiar with C will know that an unsigned eight bit value can store a value from 0 to (2^8 – 1), or 255, before running out of bits to use and becoming zero again. Similarly, an unsigned 16 bit value may store a value from 0 to (2^16 – 1), or 65535 before doing the same. Our project needs a fairly long delay, of 1/20 of a second. That’s quite short to us humans, but to a microcontroller capable of millions of instructions per second it’s a long time indeed! So running at 1MHz, our timer needs to count to 49999 before 1/20th of a second has elapsed – the normal calculated value is decremented by one, as the 0th count of the timer still takes one tick. That’s a very large value – too large for an 8 bit value! We’ll need to use the 16 bit timer 1 instead. Firstly, we need to start the timer at the top of our main routine, so that it will start counting. To do this, we need to supply the timer with a clock; as soon as it is clocked it will begin counting in parallel with the AVR’s CPU core (this is called synchronous operation). To supply a clock of Fcpu to the timer 1 circuits we need to set the CS10 bit (which selects a Fcpu prescale of 1 – more on that later) in the TCCR1B, the Timer 1 Control Register B. Now, with only one line of code, we’ve started the hardware timer 1 counting at 1MHz – the same speed as our AVR. It will now happily continue counting independently of our AVR. However, at the moment it isn’t very useful, we still need to do something with it! We want to check the timer’s counter value to see if it reaches 1/20 of a second, or a value of 49999 at 1MHz as we previously calculated. The current timer value for timer 1 is available in the special 16-bit register, TCNT1. In actual fact, the value is in two 8-bit pair registers TCNT1H (for the high byte) and TCNT1L (for the low byte), however the C library implementation we’re using helpfully hides this fact from us. Let’s now add in our check to our code – it’s as simple as testing the value of TCNT1 and comparing against our wanted value, 49999. To prevent against missed compares (where the timer updates twice between checks so our code never sees the correct value), we use the equal to or more than operator, “>=”. Great! We’ve only got one more line of code to write, to reset the timer value. We already know the current value is accessed via the TCNT1 register for Timer 1, and since this is a read/write register, we can just write the value 0 to it once our required value is reached to rest it. And there we have it! We’ve just created a very basic program that will toggle our LED every 1/20 of a second at a 1MHz clock. Testing it out on physical hardware should show the LED being dimmer than normal (due to it being pulsed quickly). Good eyesight might reveal the LED’s very fast flickering. Next, we’ll learn about the prescaler so we can try to slow things down a bit. In part one of this tutorial we learned how to set up our 16-bit timer 1 for a 1/20 second delay. This short (to us humans) delay is actually quite long to our AVR – 50,000 cycles in fact at 1MHz. Notice that Timer 1 can only hold a value of 0-65535 – and we’ve almost reached that! What do we do if we want a longer delay? One of the easiest things we can do is to use the timer’s prescaler, to trade resolution for duration. The timer prescaler is a piece of timer circuitry which allows us to divide up the incoming clock signal by a power of 2, reducing the resolution (as we can only count in 2^n cycle blocks) but giving us a longer timer range. Let’s try to prescale down our Fcpu clock so we can reduce the timer value and reduce our delay down to a nice 1Hz. The Timer 1 prescaler on the MEGA16 has divide values of 1, 8, 64, 256 and 1024 – so let’s re-do our calculations and see if we can find an exact value. The results are interesting. Of the available prescaler values, we can immediately discount 256 and 1024 – they do not evenly divide into our wanted delay period. They are of course usable, but due to the rounding of the timer count value the resultant delay will be slightly over or under our needed delay. That leaves us with three possible prescales; 1, 8 and 64. Our next task is to remove the values that aren’t possible. On an 8-bit timer, that means discounting values of more than (( 2 ^ 8 ) – 1), or 255, as the value won’t fit into the timer’s 8-bit count register. For our 16-bit timer, we have a larger range of 0 to ((2 ^ 16) – 1), or 65535. Only one of our prescaler values satisfies this requirement – a prescale of 64 – as the other two possibilities require a timer count value of more bits than our largest 16-bit timer is capable of storing. Note I’ve removed the timer setup line, as it is no longer valid. We want to set up our timer to run at Fcpu/64 now. To do this, we need to look at the datasheet of the MEGA16 to see which bits need to be set in which control registers. Compile it, and we’re done! Remembering that our timer runs as soon as it gets a clock source, our program will now work, flashing the LED at a frequency of 1Hz. So far, we’ve learned how to use the timers in their most basic counting mode to delay a specified duration. However, we’ve also discovered a limitation of the timers – their maximum duration that their timer count registers can hold. We’ve managed to get a 1Hz delay out of a prescaled 16-bit timer with a prescale, but what if we want a delay of a minute? An hour? A week or year? Compile and run, and the LED should toggle once per minute. By extending this technique, we can produce delays of an arbitrary duration. One point of interest is to note that any timing errors compound – so if the timer input frequency is 1.1MHz rather than 1.0MHz our one minute timer will be sixty times that small error out in duration. For this reason it is important to ensure that the timer’s clock is as accurate as possible, to reduce long-term errors as much as possible. Up until now, we’ve been dealing with the timers in a very basic way – starting them counting, then comparing in our main routine against a wanted value. This is rather inefficient – we waste cycles checking the timer’s value every time the loop runs, and slightly inaccurate (as the timer may pass our wanted compare value slightly while processing the loop). What if there was a better way? Well, there is. The AVR timers usually incorporate a special function mode called “Clear on Timer Compare”, or CTC for short. The CTC operating mode does in hardware what we’ve previously experimented in software; it compares in hardware the current timer value against the wanted value, and when the wanted value is reached a flag in a status register is set and the timer’s value reset. This is extremely handy; because the comparing is done in hardware, all we have to worry about is checking the flag to determine when to execute our LED toggling – much faster than comparing bytes or (in the case of the 16-bit timer) several bytes. CTC mode is very straightforward. Before we look into the implementation, let’s pseudocode what we want to do. Very short, and very simple. Note that the name of the mode is Clear on timer compare – the timer’s value will automatically reset each time the compare value is reached, so we only need to clear the flag when the delay is reached. This set-and-forget system is very handy, as once the timer is configured and started we don’t need to do anything other than check and clear its status registers. Now, we need to flesh out the skeleton code we have. First up we need to configure our timer for CTC mode. As you might be able to guess, we want to configure our timer, thus the bits we want will be located in the timer’s Control registers. The table to look for is the one titled “Waveform Generation Mode Bit Description”, and is located in timer Control register descriptions for each timer. This table indicates all the possible timer modes, the bits required to set the timer to use those modes, and the conditions each mode reacts to. You should note that our previous examples have ignored this table altogether, allowing it to use its default value of all mode bits set to zero. Looking at the table we can see that this setup corresponds to the “Normal” timer mode. We want to use the CTC mode of the timer, so let’s look for a combination of control bits that will give us this mode. Interestingly, it seems that two different combinations in Timer 1 of the MEGA16 will give us the same CTC behaviour we desire. Looking to the right of the table, we can see that the “Top” value (that is, the maximum timer value for the mode, which corresponds to the compare value in CTC mode) uses different registers for each. Both modes behave in the same manner for our purposes and differ only by the register used to store the compare value, so we’ll go with the first. Looking at the timer control registers (TCCR1A and TCCR1B) you should notice that the WGM1x bits – used to configure the timer’s mode – are spread out over both registers. This is a small pain as you need to find out which bits are in which register, but once found setting up the timer becomes very easy. In fact, as we only have one bit to set – WGM12 – our task is even easier. The MEGA16’s datasheet says that WGM12 is located in the TCCR1B register, so we need to set that. The second task for this experiment is to set the compare value – the value that will reset the timer and set the CTC flag when reached by the timer. We know from the datasheet that the register for this is OCR1A for the MEGA16 in the first CTC timer mode, so all we need is a compare value. From our previous experiment we calculated that 1Hz at 1MHz with a prescaler of 64 needs a compare value of 15624, so let’s go with that. There, almost done already! Last thing we need is a way of checking to see if the compare has occurred, and a way to clear the flag once its been set. The place to look for the compare flags is in the timer’s Interrupt Flag register – an odd place it seems, but the reason will become clear in the next section dealing with timer interrupts. The MEGA16’s Timer 1 interrupt flags are located in the combined register TIFR, and the flag we are interested in is the “Output Compare A Match” flag, OCF1A. Note the “A” on the end; Timer 1 on the MEGA16 has two CTC channels (named channel A and channel B), which can work independently. We’re only using channel A for this experiment. Very strange indeed! In order to clear the CTC flag, we actually need to set it – even though it’s already set. Due to some magic circuitry inside the AVR, writing a 1 to the flag when its set will actually cause it to clear itself. This is an interesting behaviour, and is the same across all the interrupt bits. Note that when clearing the OCF1A flag, we assign its value to the TIFR register. This is because it will assign a logic one to the flag’s position (clearing it) but also because as writing zeros to the other flags won’t affect them, we can go ahead and use the smaller (codesize-wise) direct assignment, rather than ORing the register to form a read/modify/write sequence. This is also beneficial because it prevents the compiler from writing logic one to the other flags if they were already set via the read/modify/write, which would clear unwanted flags. Important: The interface for defining and working with Interrupts has changed in the more recent versions of WinAVR – please make sure you’ve updated your installation to the latest version if you encounter errors relating to the unknown macro “ISR”. For all our previous experiments, we’ve been using a looped test in our main code to determine when to execute the timer action code. That’s fine – but what if we want to shift the responsibility of choosing when to execute the timer code to the AVR hardware instead? To do this, we need to look at the timer interrupts. Interrupts are events that when enabled, cause the AVR to execute a special routine (called an Interrupt Service Routine, or ISR for short) when the interrupt conditions are met. These interrupts can happen at any time and when executing the main routine is paused while the ISR executes, the the main routine continues until the next interrupt. This is useful for us, as it means we can eliminate the need to keep checking the timer value and just respond to it’s interrupt events instead. The AVR timers can have several different Interrupts – typically Overflow, Compare and Capture. Overflow occurs when the timer’s value rolls past it’s maximum and back to zero (for an 8 bit timer, that’s when it counts past 11111111 in binary and resets back to 00000000). However, for this section we’ll deal with the Compare interrupt, which occurs in CTC mode when the compare value is reached. We can start off this by working with our skeleton main code, used in previous examples. I’ll skip the details on the parts already discussed in previous sections. Note how it’s a modified version of the non-interrupt driven CTC example covered in the last section. All we need to do is tell the timer to run the compare ISR we define when it counts up to our compare value, rather then us polling the compare match flag in our main routine loop. Where “VectorName” is the name of the ISR vector which our defined ISR handles. The place to go to find this name is the “Interrupt” section of the datasheet, which lists the symbolic names for all the ISR vectors that the chosen AVR supports. When writing the vector name into GCC, replace all spaces with underscores, and append “_vect” to the end of the vector’s name. Like in part four we are still dealing with Channel A Compare of Timer 1, so we want the vector named “TIMER1 COMPA”. In GCC this is called “TIMER1_COMPA_vect”, after performing the transformations outlined in the last paragraph. Once the ISR is defined, we can go ahead and write out it’s body, adding the LED toggling code. Notice how we don’t clear the CTC event flag like in part four – this is automatically cleared by the AVR hardware once the ISR fires. Neat, isn’t it! Running the code so far won’t yield any results. This is because although we have our ISR all ready to handle the CTC event, we haven’t enabled it! We need to do two things; enable the “TIMER1 COMPA” interrupt specifically, and turn on interrupt handling on our AVR. The way to turn on our specific interrupt is to look into the second interrupt-related register for our timer, TIMSK. This is the Timer Interrupt Mask register, which turns on and off ISRs to handle specific timer events. Note that on the MEGA16 this single register contains the enable bits for all the timer interrupts for all the available timers. We’re only interested in the Timer 1 Compare A Match interrupt enable bit, which we can see listed as being called OCIE1A (Output Compare Interrupt Enable, channel A). By setting that bit we instruct the timer to execute our ISR upon compare match with our specified compare value. Let’s put that line into our program’s code and see how it all looks. Only one more thing to do – enable global interrupts. The AVR microcontrollers have a single control bit which turns on and off interrupt handling functionality. This is used in pieces of code where interrupt handling is not desired, or to disable interrupts while an ISR is already being executed. The latter is done automatically for us, so all we need to do is turn on the bit at the start of our code, and our compare interrupt will start to work. The command to do this is called “sei” in the avr-libc library that ships with WinAVR, and is named to correspond with the assembly instruction which does the same for AVRs (the SEI instruction). That’s irrelevant however, as we just need to call the command in our code. And our example is finished! Running this will give a nice 1Hz LED flashing, using the timer’s event interrupts. The nice thing is that the timer operation is now completely handled for us in hardware – once set up, we just need to react to the events we’ve configured. Notice that our main loop is now empty; if this is the case you may put sleep commands inside the main loop to save power between compares. You probably think by now that we’ve improved our example as much as possible – after all, what more improvements are there to make? Well, it’s time to finish of the CTC topic by looking at the hardware outputs. All AVRs’ pins have alternative hardware functions. These functions (currently non re-routable) when activated interface the IO pins directly to the AVR’s internal hardware – for instance the Tx/Rx alternative functions which are the direct interface to the AVR’s USART subsystem. Alternative pin functions can be very useful; as they can be internally connected straight to a hardware subsystem, the maximum possible performance can be achieved. In this section, we’ll be looking at the Compare Output settings of the AVR timer. Looking at the timer 1 control registers, we can see a few pairs of bits we’ve previously ignored, called (for timer 1) COM1A1/COM1A0 and COM1B1/COM1B0. Bonus points to anyone who’s linked the “A” and “B” parts of the bit names to the timer compare channels – you’re spot on. These bits allow us to control the hardware behaviour when a compare occurs. Instead of firing an interrupt, the hardware can be configured to set, clear or toggle the OCxy (where “x” is the timer number, “y” is the channel letter for timers with more than one channel) hardware pins when a compare occurs. We can use the toggle function with our LED flasher, so that the hardware toggles the LED’s state for us automatically, making it a true set-and-forget operation. So timer 0 has one Compare Output channel, while timer 1 has two (channels A and B) as we’ve already discovered. As always we’ll just deal with Channel A in our example. Now we have a problem. All the previous chapters have assumed the LED is attached to PORTB, bit 0 – but we’ll have to move it for this chapter. As stated above the alternative functions cannot be moved to another pin, so we must move moses…I mean, our LED, to the pin with the required alternative function. All we need is to configure the timer so that it’ll toggle our channel A output each time the timer value is equal to our compare value. The datasheet has several descriptions for the functionality of the COM1Ax and COM1Bx bits, so we need to find the table corresponding to the mode we’re using the timer in. CTC mode isn’t listed – instead the appropriate table is listed as “Compare Output mode, Non PWM”. PWM stands for “Pulse Width Modulation”, and will be covered later on in this tutorial. For now, it is sufficient to know that the CTC mode is not a form of PWM and thus the non-PWM bit description table is the one we’re looking for. To make the channel A Compare Output pin toggle on each compare, the datasheet says we need to set bit COM1A0 in TCCR1A. That’s our missing line – let’s add it in! Simple, isn’t it! We’ve now created the simplest (code-wise) LED flasher possible using pure hardware functionality. Running this will cause the LED to flash at 1Hz, without any code other than the timer initialization! Well, now that we’ve had fun creating a LED flasher via a variety of software and hardware CTC methods, we’ll move on to one last LED flashing program. This time we’ll be using a different Timer event to manage the toggling of the LED – the overflow. The answer is simple, if rather boring. In the event of the timer register exceeding its capacity, it will automatically roll around back to zero and keep counting. When this occurs, we say that the timer has “overflowed”. So why would we need the overflow interrupt? Well, I leave that as an excersize to the reader. However, we can demonstrate it here in this tutorial – via another LED flasher, of course. Calculating the frequency of the flashing is a little different to our previous examples, as now we have to calculate in reverse (to find the frequency from the timer count and timer resolution rather than the timer count from a known frequency and timer resolution). We’ll still be working with our 16-bit timer 1 for this example, to be consistent with previous chapters. Note how our frequency decreases (and period increases) as our prescaler increases, as it should. Because we have a reasonably slow main system clock, and a large timer count register, we end up with frequencies that are easy to see with the naked eye (with the exception of the case where no prescaler is used). Unlike the CTC method however, we are limited to the frequencies above and cannot change them short of using a smaller timer, different prescaler or different system clock speed – we lose the precision control that the CTC modes give us. For this example, we’ll use a prescaler of 8, to give a 1.8Hz flashing frequency, and a period of about half a second. Almost time to get into the code implementation. But first, pseudocode! I’m going to extrapolate on the preceding chapters and jump straight into the ISR-powered example, rather than begin with a polled example. It works in the same manner as previous polled experiments, except for the testing of the overflow bit rather than the CTC bit. Let’s begin with filling in the bits we can already do. The ISR code is easy – we can use the same ISR as part five, except we’ll be changing the compare vector to the overflow vector of timer 1. Looking in the MEGA16 datasheet, the overflow interrupt for timer 1 is obvious – it’s listed as “TIMER1 OVF” in the Interrupts chapter. Just like in part five, we need to replace the spaces in the vector name with underscores, and add the “_vect” suffix to the end. We can also fill in the “Enable global interrupts” line, as that is identical to previous chapters and is just the “sei()” command from the header file. The last thing we need to do, is start the timer with a prescaler of 8. This should be easy for you to do – if not, refer back to chapter 2. One neat application of the overflow event is for creating a CTC timer on AVRs which don’t support true hardware CTC. It’s not as neat as the pure hardware CTC discussed in part six, but faster than the pure software CTC discussed in part two. CTC works by having a fixed BOTTOM value – that’s the timer’s minimum value – of zero, and a variable TOP value, the value at which resets the timer and fires the event. However, with the overflow event we seemingly have a fixed BOTTOM of again zero, and a fixed TOP of the maximum timer’s value. Not so – with a small trick we can adjust the BOTTOM value to give us the equivelent of a CTC implementation standing on it’s head. This tecnique is called timer reloading. When configured, we preload the timer’s count register (which is both readable and writeable) with a value above zero. This shortens the time interval before the next overflow event, although only for a single overflow. We can get around that by again reloading the timer’s value to our non-zero value inside the overflow event for a hybrid software/hardware CTC. So we need to preload and reload our overflow timer on each overflow with the value 49911 to get our desired 1Hz delay. Since we’ve already gone over the code for an interrupt-driven overflow example in part seven, we’ll build upon that. Both the reloading and preloading of the timer takes identical code – we just need to set the timer’s count register to the precalculated value. The timer’s current count value is avaliable in the TCNTx register, where “x” is the timer’s number. We’re using the 16-bit timer 1, so the count value is located in TCNT1. The previous sections of the timers tutorial have been dealing with a simple task – flashing a LED. We’ve managed to accomplish that task using a variety of methods which all center around the “Clear On Timer Compare” (or CTC) method of using the timer, in both software and hardware. But what if we want to dim the LED instead? Now we are getting into a new timer concept, that of Pulse Width Modulation, abbreviated to PWM for short. Pulse Width Modulation allows us to interface our digital components with the analogue world. We can use PWM to adjust a motor’s speed, a LED’s brightness or a speaker’s tone. PWM is a very important concept, which is used all throughout the world of digital electronics. It is a way of approximating an analogue source, which with a little filtering can be used as a real analogue source (albeit with a few limitations). It’s important to note that PWM does not change our AVR’s limitations; the signal sent out by the timer is still a true digital signal. However, by altering the on and off time of the signal at a given frequency, we can adjust the average on time to give an approximate analogue signal. This signal is good enough for immediate use in many applications – including motor speed control and LED dimming – without any extra filtering, or with the addition of a capacitor the output can be smoothed to a real analogue wave. The top waveform is a traditional analogue signal, varying smoothly from GND to VCC volts. The bottom waveform is a digital representation of the top, using PWM. PWM allows us to set an overall frequency, and then vary the on and off time (called the duty cycle) of the output within each timer cycle. A longer duty cycle gives a longer on time, resulting in an analogue representation closer to the VCC voltage. A duty cycle of 100% (on for the entire cycle) gives a VCC output, while a duty cycle of 0% (off for the entire cycle) gives a GND output. When we use the CTC timer mode, what we are actually doing is essentially PWM, but with a fixed duty cycle of 50%, and a variable frequency. For this example, we’re using PWM and will conversely be using a fixed frequency and varying the duty cycle to dim our LED. Before we can explore the different modes, we need to understand a little of the timer terminology. Frequency, as we know, is the number of cycles per second that the timer runs at – a higher frequency gives us a faster timer. In the PWM world, having a faster PWM frequency gives us finer control over the output, as we can respond faster to new PWM duty cycles. This is especially important when using PWM to produce audio from digital samples; a faster PWM frequency is required to give the full output frequency range by varying the duty cycle. Next, we have the BOTTOM value. This is the lowest value that the timer will reach in the current mode. In all timer modes on all AVRs, this will be zero. Accompanying BOTTOM is TOP, which is the maximum value that the timer will reach before either (depending on the mode) resetting back to 0x00 or begin counting in reverse back to BOTTOM. For the normal mode, TOP is equal to the maximum value the timer can reach. For CTC mode, TOP is user settable, which gives us our control over the timer period. We are now using PWM, thus TOP is now set to give the PWM frequency. Finally, we have our PWM COMPARE value. This sets the duty cycle – when this value is reached the waveform is inverted from its current state. Varying the COMPARE value will give us our varying duty cycle. Now, let’s get down to business and go into the three PWM modes. Fast PWM is useful for outputting PWM values quickly, at a loss of phase correctness – changes to the duty cycle will be reflected immediately, with the new signal being phase incorrect. When selected, the timer will count up from BOTTOM to TOP, with TOP being fixed at the bit-width of the fast PWM — we are given a choice of 8, 9 or 10 bits depending on the timer bit width (8 bit timers will obviously not offer Fast PWM in more than 8-bits). The timer, when started, will count up continuously until TOP is reached, when it wraps back to BOTTOM and starts again. Inside this period when the counter reaches the COMPARE value, the output pin is set when the correct value is reached (and cleared when the timer wraps back from TOP to BOTTOM), so that varying COMPARE we get a PWM of a fixed frequency but a variable duty cycle. This gives us the ability to change the duty cycle rapidly, in applications where the phase change does not matter. Applications such as motor control are particular about the phase, so we need to use the Phase Correct PWM mode. Notice the difference? 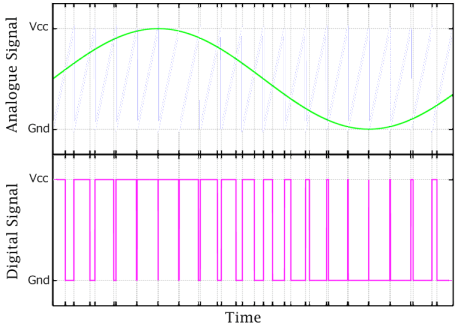 In the case of Fast PWM, the high points are always aligned to the start of each period, with a smaller duty cycle resulting in a shorter ON time. Phase Correct PWM by contrast aligns the high points to the center of each period, so that a smaller duty cycle results in a shorter ON time — but the ON times of all signals are aligned. As inducated in the Fast PWM explanation, this mode is useful in applications where the phase of the signals should not change, even if the duty cycles do. Phase Correct is slower than Fast PWM (as the name of the latter implies) due to the way Phase Correct PWM works. When selected, the timer will count up from BOTTOM to TOP, and then start counting downwards back to BOTTOM before repeating. When upcounting, reaching COMPARE will turn on the output pin, while reaching the same value when downcounting will turn the output off. This results in the timer period being twice as long as Fast PWM mode (since the timer also has to count back to BOTTOM rather than just wrapping) but produces a phase-correct signal. In Phase Correct PWM, the TOP value is variable and so the mode supports a variable PWM frequency. For generating simple audio tones from a speaker it is common to use the variable frequence of this mode to change the note pitch, and use the duty cycle to change the volume; a higher duty cycle results in a longer ON timer for the speaker, and so produces a louder sound.